Aspirants who are seeking for ONGC jobs are informed that the official notification regarding the ONGC AEE & Various Posts Recruitment 2019 has been published. Applications will be submitted through the online mode. The online application will start from 5 April 2019. Candidates will be able to fill the form till 25th April 2019. There will be a total of 785 posts. Candidates who are eligible in all aspects can apply for the same. The department, Oil and Natural Gas Corporation Limited has released the official notification regarding the ONGC AEE & Various Posts Recruitment 2019. The declared notification is available on the official website i.e. www.ongcindia.com. Candidates can go there and check all the details and criteria required to apply for the ONGC Recruitment 2019. Also, you can check it on www.testhill.com. The selection will be based on their GATE 2019 Score. Candidates will select based on their scores and a list will be created. Shortlisted candidates must be included in the written examination. The test content is different according to the relevant trades. Candidates need to prepare for the examination from these disciplines. Candidates will have to download their admit card to join the written examination. 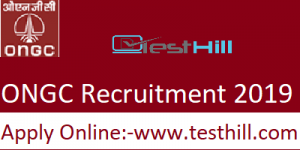 ONGC Recruitment 2019 Admit Card will be available on the official website. Candidates will be able to download it from there. They need to provide some required information like registration number, application number, and birth date/password. After filling this information, the admit card will be displayed on your computer screen. Candidates can download it here and can take printouts for the exam. Participants who going to apply for the ONGC Recruitment have to know the important dates. You can check it from here. AEE(Reservoir)- Candidates having Post Graduate Degree in Geophysics/ Mathematics/ Physics or Chemical Engineering/ Petroleum Engineering Degree with minimum 60% marks will be eligible for this post. AEE(Rest All Trades) – Candidates having an engineering degree in relevant trade with minimum 60% marks will be eligible for this post. Chemist – Candidates having Masters Degree in Chemistry with minimum 60% marks will be eligible for this post. Geologist- Candidates having M.Sc/M. Tech Degree in Geological Technology/ Geology with minimum 60% marks will be eligible for this post. Rest All Posts – Candidates are suggested to read the official notification for this post wise educational qualification & eligibility criteria before applying.